New goodies in da house and I had to give them a try. 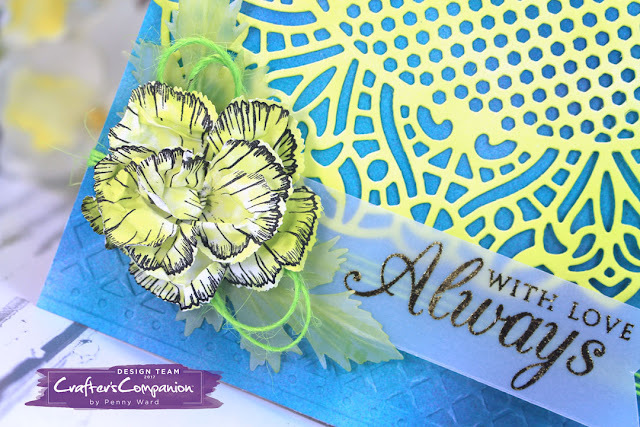 Crafter's Companion has come out with some of the coolest dies for creating cards. But you know me....I have to be different!!! Classic Carnation was die cut using 4 layers of computer paper. Stamp, color and spritz with water...then scrunch flower and let dry. Unfold flower, glue centers and scrunch again until you are happy with the look. Leaves are die cut Vellum and the sentiment is a Foil Transfer Rub On. This was literally a 10 minute card.